Where young people are leaving their mark! The group spray painting their "mark" on the free expression tunnel at NC State University. Don't know what a NCYLF is follow this link to learn more! 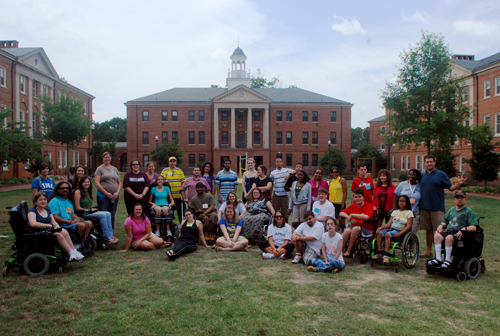 We are a dedicated group of people of all ages and abilities based out of North Carolina that seeks to promote independence, peer relations and advocacy among today's generation. We do this by holding a YLF in our state's capital. With the passing of the ADA in 1990, the current generation's opportunity for advancement is higher than it ever has been before, and we seek to take full advantage of the blossoming movement to educate ourselves and others about everything from disability history, to the independent living movement and important lawmakers and revolutionaries. Go to our contact us page for website feedback!